The Haemonetics (NYSE: HAE) update and the technical summary table below can help you manage risk and optimize returns. We have day, swing, and longer-term trading plans for HAE, and 1300 other stocks too, updated in real time for our trial subscribers. The data below is a snapshot, but updates are available now. 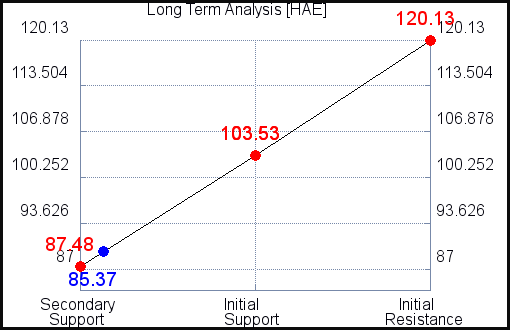 The Technical Summary and Trading Plans for HAE help you determine where to buy, sell, and set risk controls. The data is best used in conjunction with our Market Analysis and Stock Correlation Filters too, because those help us go with the flow of the market as well. Going with the flow is extremely important, so review our Market Analysis with this HAE Report. There is no current Support Plan to trigger a buy of this stock at this time. This usually means that there are no clear support levels at this time, so buying the stock as it falls could be considered catching a falling knife. Buy signals only exist if resistance breaks higher. The technical summary data is suggesting a short of HAE as it gets near 87.48, but the downside target is not available from the current data. This tells us to hold that position if it is triggered until a new downside target has been established (updates occur at the beginning of every trading session) or until the position has been stopped. The summary data tells us to have a stop loss in place at 87.74. 87.48 is the first level of resistance above 85.37, and by rule, any test of resistance is a short signal. In this case, if resistance 87.48 is being tested, so a short signal would exist.